lol, awesome! but SEVEN cats???? i *shudder* at the thought!!!! Hahah. I like the first one. It's like they each have their own little cubby hole. Hi Joanne, Thanks for the link to the original post at www.TheDailyTail.com. These cats are too cute! This is great and really funny because I need to know how to "store" my own cat. I recently started my own blog, and one of the posts will be about building your own cat house. Check it out! Cats are so easy to store. Just bring home a box; not necessarily a big one, either. They will fit themselves into any size. We have a 20 year old kitty, who actually likes to sit on top of a closed box. It's there in the dining room, and neither of the other cats will sit on it. But good old Thelma sits on it when she needs to be just a foot above the others. I'm just amazed that you got them to sit still for this! how long did this take?? I want to see the outtakes! Why does the top picture have 8 cats, but the other two only 7? Did one of the cats get lost? They are all cute cats though. lol, is the third cat up in the first picture a fake cat? Am I the only one bothered by the fact that there's 8 cats in the first picture, and 7 cats in the others? What happened to the missing cat? No newageAnofag, but you are THE only one not reading previous comments. Hi everyone! Cats, aren't they great? Maybe the later photos with the seven cats were the result of a nasty accident while stacking the eight cats in the first photo (the fake 3rd cat up was unraveled badly). The first in the stack looks like he's poopin'! To anon with cows, stackable baskets aren't the answer, it might work with portable cabins and a crane, though. Too cute but what do you do -- go to humane society and pick out cats that will cooperate? My 2 are not photo cooperative at all! Oh My that is the best organizing tip I have ever heard. Too funny! And I have 7 wild and wonderful Cats! Down from 11.... stuff happens- I'm talking a few years back. They have never made acquaintance with the rd. This feels like you're in my head... I will be using and looking for more tips! This is really cute. I have ten of these critters and the only organizing they've ever done is the Feline Union (the main purpose of which is to prevent all other types of household organization from happening). Here's one of them in action: http://sometimes-ever-after.blogspot.com/2010/01/ben.html. He's actually the union president. Love your blog! Are we sure this is not a taxidermist's display? Yipes. This is too cute! I love it - My cat tried to organize himself at times -he LOVES shelves, especially those with clothes on them. Hmm. I did not include organizing in my cats' performance review last year. It will definitely be in this year's review and they will FAIL, which is good because there is no money in the budget for raises. Ah, but such glorious organization only lasts a few seconds. At my house, we have Parades and Processions because I live with a princess, a duchess, and a Baron. Brilliant! As a Professional Organizer myself, I got an extra kick ou of this! Thanks for the smiles! Afer a browse through some clothes shops today I see the cats are modeling the latest in stripes and adding a hint of peach which is very now. Great post-- as a Professional Organizer I'm always looking for new ways to organize stuff -- great options now for client's cats. That is too cute! The best part is, if you just leave it on the floor, they'll climb in themselves. Poor black cat..it's eye's say "Really? You are making me do this?" and "I am SO embarrassed." 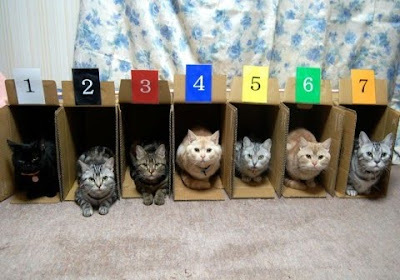 I want to know how one goes about making the 7 cats all keep the same pose for the photo? OK- it made me laugh out loud!! I also showed my daughter and we giggled together. We can't get our 1 dog to stay- impressive! I would like to point out that the black cat in every picture lookes very un amused. Do you have to put them in order of dominance? Usually, the most dominant cat gets the highest perch. I wouldn't think that they would stay very long if they were below their dominance level. My friend sent this to me today and it has got to be the cutest thing I have ever seen. It totally brightened my day! I also just realized that in the second picture they are all in gift bags! Too Cute! Number 2 is getting a head start! LOL! Excellent idea! Have you sent this to Helouise??? certainly disproves the "can't herd cats" observation :o) I would like to see the UTUBE video of "how this was done". I'd love to have a house full of cats! That big grey fellow is hilarious! He looks like he's in charge and the most enthusiastic. His poses are so cute, especially how he puts his front paws together and does the head tilt. Joanne, thank you for the link to The Daily Tail! Not a problem, Daniela, it certainly went down a treat! You're the most lovely crazy cat lady! I love cats, mine is called Cora, is very small. 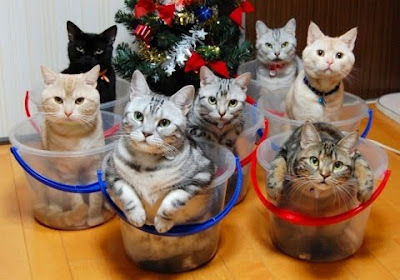 Hello well i never knew that we can organize cats cause i have some cats but i don't know how to organize it . The most funny thing I have seen lately. I love cats. Especially liked the first one. I keep coming to this post to laugh time to time. I would really like to know what they were staring at? And how did you manage to keep them all stable like that? This is beyond adorable. 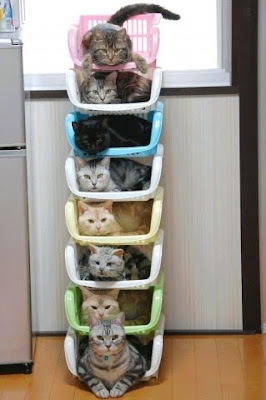 If your a crazy cat lady then you'll have to find clever ways to store your cats. 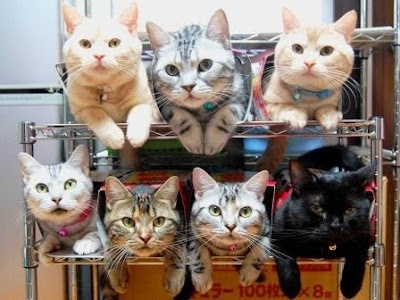 Otherwise most normal people with one or two cats don't need to worry about massive cat storage. What's That Coming From The Ceiling? Is Nickleback The Worst Band Ever?